Arthur Miller’s The Price plays at the Wyndham’s Theatre after a run at the Theatre Royal Bath in August 2018. One of Miller’s lesser-known works, the story centres around the Franz brothers trying to sell their late father’s family furniture. The brothers haven’t spoken in years, and their differences come to light in a play where the emotional cost of previous decisions has a great price to pay. The full cast from the Theatre Royal Bath will reprise their roles for this production. 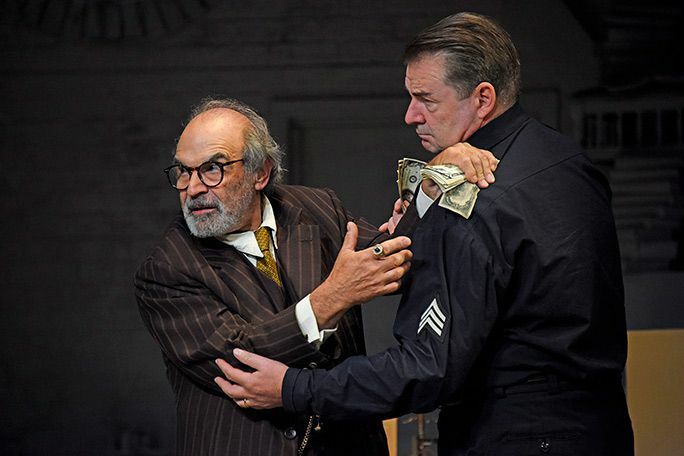 David Suchet will play Gregory Solomon, a Russian-Jewish antique dealer. Best known for playing Hercule Poirot, Suchet’s stage credits include Amadeus at the Old Vic and The Importance of Being Earnest at the Vaudeville Theatre, as well as appearing in the Pinter at the Pinter season. Olivier award-winning actor Brendan Coyle will play Victor Franz. He will perform in The Price after recently starring in St Nicholas at the Donmar Warehouse. Coyle has also performed in Mojo at the Harold Pinter Theatre and Smolensk at the Theatre Royal Haymarket. Adrian Lukis will play Walter Franz, Victor’s brother. Best known for starring in Pride and Prejudice, his stage credits include Versailles at the Donmar Warehouse and Orsons Shadow at the Southwark Playhouse. Sara Stewart plays Esther Franz. Recognisable from television shows in Fresh Meat and New Tricks, she has appeared on stage in Proof at the Donmar Warehouse and Present Laughter at the National Theatre. Victor Franz is a New York cop trying to unload his family’s furniture that’s stashed in the attic of the family home. His wife Esther wants to earn enough money to take a holiday, but when Victor enlists the help of Gregory Solomon to sell the possessions, the money that could be earned from the furniture becomes a contentious point of discussion. When Victor’s brother Walter re-enters the family life, the previously estranged brothers are reunited at the death of their father in a story where love means more than material possessions and financial gain. LOOKING FOR CHEAP THE PRICE TICKETS AT THE WYNDHAM'S THEATRE? With our huge range of cheap tickets for plays on in London, a visit to the West End has never been better value. Book with us for The Price and enjoy a great play at a price that won’t bring down the curtain on your budget.